Hey, remember that unfinished Neo Geo fighting game that was discovered lurking on an arcade board? And how nobody knew what the hell it was? The man behind the game has been found, and he’s been able to reveal all kinds of stuff about it. Having seen the footage of the unfinished game, Japanese site ITMedia tracked down creator Kengo Asai (via Mad Mans Cafe), who worked on other fighting games like The Last Blade, Schmeiser Robo and Voltage Fighter Gowcaizer. Asai says that the game, despite never having an official name, was known internally first as Darkseed. When it was discovered there was already a game called Darkseed, they changed it to Dragon’s Heaven. Development began in either 1995 or 1996. 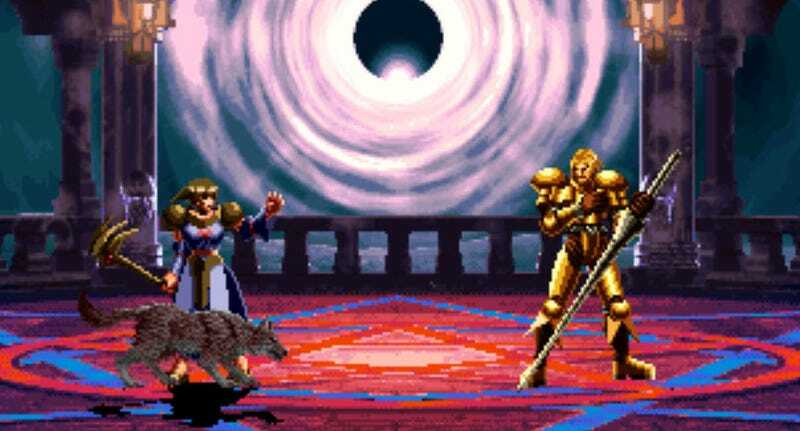 It had some cool features: players could pursue “Lawful”, “Neutral”, or “Chaotic” morality paths dependent on decisions made after battles, and each bout’s three rounds would take place over different times of the day, giving characters strengths and weaknesses depending on whether it was morning, noon or night. You can read a full translation of ITMedia’s story on MMCafe.